Where do I use my Carrentals.co.uk voucher code? You can then paste your code into the box provided and click 'Apply' to redeem your savings before you continue with the payment method. 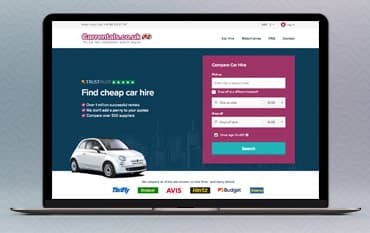 Carrentals.co.uk has been delivering the cheapest car hire prices for over 12 years and in that time they’ve been nominated for numerous awards, being declared the "Best Car Hire Website" at the Travolution Awards in both 2008 and 2013. Car rentals believe that they have the best car hire comparison site on the internet and with over 1 Million rentals to date, they compare even more car hire brands than ever before with names including Europcar, Hertz, Avis, Thrifty, Sixt, Alamo, and many others. Over 91% of customers said they would book again through Car Rentals; based on low prices, the range of suppliers, the easy to follow website and the advice and support available. Car Rentals offer comparison prices for car hire in locations all over the world including London, Amsterdam, Lisbon, Dominican Republic, Brazil, Thailand, Malta, the USA, China and many more. To find the best car hire prices in a location of your choice simply enter your pick up and drop off location and time, as well as your age, then press search and you’ll be displayed with a huge list of results showing you what car hire is cheapest from one of the top suppliers you can trust. As well as car hire, Car Rentals also provide comparison prices for motorhome rentals. They have the best rental suppliers and service guaranteed, are available in more than 38 countries worldwide and offer over 500 pick-up locations. Car Rentals offer motorhome and campervan hire in countries all over the world including Australia, Canada, Finland, France, Germany, Iceland, Ireland, Italy, the Netherlands, New Zealand, Norway, Portugal, South Africa, Spain, United Kingdom, United States and many more. At Carrentals.co.uk you can compare the rates and features of multiple suppliers, browse through the selection of motorhome hire on offer and if you have any questions, the excellent customer service team is at your disposal. Pay just 30% deposit only and search, confirm and pay in just 3 simple steps and you can find and book your motorhome hire in no time. Carrentals.co.uk offer people carrier car hire as well as MPVs and minibuses for hire. All these vehicles have between 5 and 15 seats, so whether you’re travelling in a small group or a large party, you can find a car that’s big enough to fit you all in. Some of the most popular people carriers that customers like to hire include the SEAT Alhambra, the Ford S-MAX, the Renault Grand Scenic, the Peugeot 5008, the Ford Galaxy, the Vauxhall Zafira Tourer, the Volkswagen Touran mini and the Citroën C4 Picasso, however there are loads more options to choose from if none of these are suitable. Car Rentals search and compare prices of over 50 car hire companies worldwide to offer you an easy and quick way to specifically search and hire larger vehicles. They provide budget people carrier hire in over 10,000 locations worldwide from International airports to small towns and villages. With Sanford airport, Orlando airport and LAX airport being particularly popular with people looking to book people carrier hire and 7 seater hire for their Disney World Florida and Disneyland California holidays. In Europe, the top destinations include Malaga airport, Alicante airport, Faro airport, Charles De Gaulle airport, Paphos airport and Rome airport, though there is car hire available in plenty more locations and airports across the globe. To find yours in your desired location simply use the people carrier search bar. Your reservation will be confirmed within 48 hours. In the event that you do not receive a confirmation, please check if your spam filter has marked the confirmation mail as spam. If you need to change or cancel your car hire please use the contact form to contact Car Rentals. If the change or cancellation is at short notice (within 48 hours), they kindly ask you to contact them by phone. Carrentals.co.uk has been providing simple and straightforward car hire comparison services since 2003. With some of the cheapest prices, over 1 million successful rentals and 8000+ locations available worldwide, with Car Rentals you’re guaranteed to find affordable car hire from some of the best suppliers in the industry. Compare prices from the huge car hire brands such as Thrifty, Hertz, Avis, Europcar, Budget and Alamo and book online with a Car Rentals voucher code from us to save money on your order. With all this, free cancellations and the best price guarantee, Carrentals.co.uk is the number one place for all your car hire needs. We are constantly on the hunt for Voucher Codes for Carrentals.co.uk to help you with your money saving. Our experts check dozens of sites for secret codes including NHS discounts, student sites & social media channels saving you time & money!